A life-changing accident in 2009 left PEI school bus driver Ann Ramsay with paralysis of the lower body. Ramsay retrained and went back to work as a receptionist. She also added disability rights activist to her already significant union work. 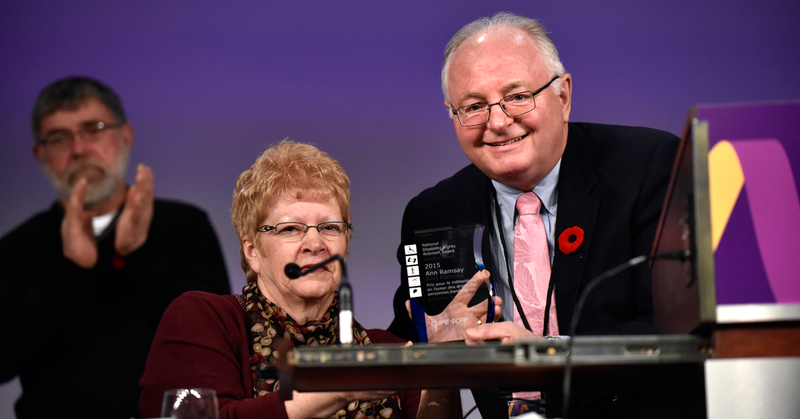 Honored for her strength and resilience, Ramsay is the recipient of the CUPE 2015 National Disability Rights Award (for) Activism. When the accident happened, Ramsay was an active and engaged member of CUPE 1770. Working with the union, coworkers and the employer, for Ann’s accommodation in the workplace meant retraining, changing jobs and joining a different CUPE level. In 2010 Ramsay joined the CUPE National Persons With Disabilities Committee. She currently serves as committee co-chair. She is also member of CUPE P.E.I.’s Equality Committee and has presented on disability rights at the CUPE P.E.I. Convention, to the CUPE Division Executive. Ramsay is also the face for a powerful poster that was part of CUPE’s “Solidarity of Abilities” campaign. A strong advocate for Duty to Accommodate training, Ramsay has helped to organize workshops in her division on the topic. Ramsay closed her remarks with a saying for gratitude. “A true friend knows your weakness…recognizes your disabilities but emphasizes your possibilities,” she said.